All smart people should create alternative accounts in some free, uncensored networks as soon as possible. You never know when they’ll come for you too. No one is safe. 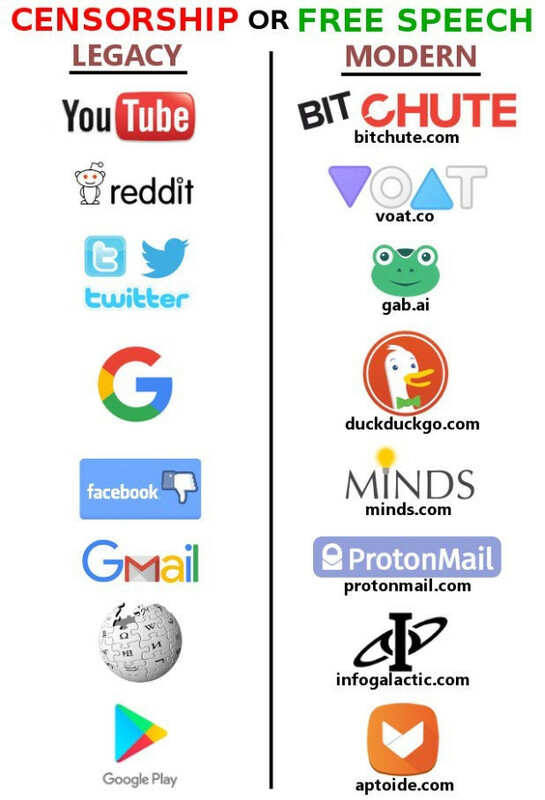 Following list is the list of interesting YouTube channels that are in the highest danger of censorship. Most of them were already prosecuted in some way for “wrongthink” (although complete ban is not so often…yet). You can find links to their channels in current crooked services in one column and the modern, free replacements in the other one. What is important – I don’t agree with all of the opinions presented by channels above. I even quite dislike some of them. But all of them have the right to speak their mind and throw their opinions or point of view into public forum. Every time when someone begun to control what you can think and say and have the authority to punish you for wrongthink, it ended in very, very bad place. If you’re interested in my personal recommendation, I’ll give it in separate articles (article currently in progress). If you have tip for some great YouTube channels that are in danger (and ideally have more than 100k followers), please let everybody know in the comment section. The same is true when you find some mistake or obsolete link/info. I started to write changelog so it’s clear when some channels were added, something changed etc.